Haju's been lingering around since last episode. Is it because she is taking up Josh's offer of friendship, or does she have more nefarious schemes in mind? Join Josh and Emily as they probe the inner machinations of the Haunted Jukebox once again in this all-random episode, where we discuss things like how to make a puppy fall asleep, the absolute best name for a track, and just exactly what it means to split this show in half. If you don't like it, you can have your tokens back, but you'll have to call the company who owns the machine. Then, stay tuned for a special Patron-submitted VGM Karaoke. 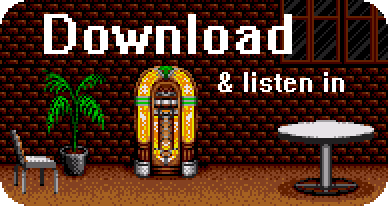 You got it right here at the VGM JUKEBOX! HAHAHA! Haju hijacked an episode! VGMJB got Hajacked! That was seriously dope, man! Much respect! Back to the usual ramblings. I’m guessing that so many people need white noise these days because we are addicted to having aural and/or visual distractions. We aren't comfortable being alone with ourselves, and silence forces that. Daytona USA is not 16-bit. It was created on Sega’s Model 2 hardware, which was developed by aeorspace firm Lockheed Martin. Model 2 uses the Intel i960, is a 32-bit architecture. Incidentally, Sega’s first 32-bit game was Rad Mobile, using their System 32 board. That came out in ‘91. And going further into the weeds, the first 32-bit arcade game (to my knowledge) was Williams’ Narc, which came out in ‘88(!). I remember the magazines spilling much ink over the game’s 32-bittedness at the time. Regarding your consideration to play 50/50 Old vs. New tracks, I have a thought: Why don’t you just play what’s requested and see where it leads? I think the issue will work its way out organically. I guess front-loading an old-school track is also fine....but making a condition to play a certain number of old selections creates an arbitrary condition that undermines the whole mission of VGMJB. You guys created the podcast to curate the memories and experiences of its listeners, and that should apply without regard to the console generation. Look, I’m likely one of the most old-school guys here. I played the Atari 2600 when it was contemporary, the last new system I purchased was the PlayStation 2, and my own requests are about 95% 16-bit. But I DEEPLY appreciate newer selections. I purchased the whole No Man’s Sky OST after you guys played Heliosphere. The show works wonderfully as it is, and I'm confident that it will continue to work wonderfully no matter the mix. Thanks man! I consider a comparison to Blackalicious to be a HUGE compliment, so thank you! I'm positively proud when people appreciate my "P" filled pinball poetry. Pthanks. If anyone is inclined to listen to it again, I uploaded the track to my soundcloud. You can listen to it there, along with some of my original compositions. Regarding the sound used on Daytona USA, it had 2 Sega 315‑5560 chips processed by a Motorola 68000 which combined had the capacity of 56 CD-quality PCM channels which is pretty insane for an arcade game from 1993 to be honest! In my personal opinion, I do prefer the arranged live versions of the Daytona tracks used in the Saturn port, but the arcade sounds do have a pretty charming sound with the sampled instruments and Takenobu Mitsuyoshi's synthesized voice really does give it that unique feeling that arcade Daytona USA brings! On that note,I kinda like alternating between old-school chiptune and new-school live tracks. I grew up in the fifth generation of consoles where we were dealing with both streaming CD audio and chiptune music so I kinda have fondness for both styles (maybe leaning towards live tracks in my own requests but do appreciate some good chiptune tracks). No matter what you guys end up going with, you'll at least still have a good show of game music discovery every week! Although I can see what Nathan meant about just letting the music come in naturally, letting people who normally don't listen to one style discover them for themselves. I don't know what the other patrons are requesting or know what tracks get picked each episode, and I suppose the guessing is kinda the fun part of this show. In any case, I'm sure you guys will think of something. I mean the thing that differentiates this from the Legacy Music Hour (which only plays tracks through fourth gen consoles) is that you play from any style or era. Like the site's masthead says: "There's no restriction on platform, console, or era." This kinda makes this shows selection much less predictable than most of the other VGM podcasts. As to the question about pinball, YES! I do love pinball, both real pinball and video pinball. I'm not as avid a player as some people I know, and I don't own any real pinball machines, but I will play just about any time there's a machine and I have some quarters and time. I've even managed to hold my own in local tournaments and even won a Pro Pinball tournament hosted by GOG.com. So, I am mostly braggadocio, but I have a few skills to back up my talk. I also want to commend Haju's good taste! I discovered the SNES version of Pac-In-Time from a Legacy Music Hour episode and then went down the rabbit hole of researching more about Frederic Motte. He is really fantastic, though most of his work was on Amiga, so he's not as well known to console VGM fans. I've been meaning to recommend some to the jukebox. As a matter of fact, I just came here to say that I've spent most of my Saturday finding and listening to Frederic Motte music -- and it was time well used. For those who want to follow us down this rabbit hole, he has a Bandcamp page under the name 'elmobo'. I wasn't going to say anything because the internet doesn't need more people complaining and it wasjust an episode of a podcast I really love and listen to for free, but since you guys brought it up I did sort of feel off about the last episode. I'm not anti-new tracks but I guess I am anti-rock tracks and vocal tracks in vgm. Just don't care for them. Then again you can always skip forward in podcasts so it isn't any hardship! and I need white noise because otherwise I hear the tinnitus in my ear! On the 50/50 issue, I don't think you should do a lot of extra work to try to solve this balance on a per episode basis. Ultimately, the show can only be as balanced as our recommendations, so imposing a somewhat arbitrary structure on that might be an unnecessary step. On the other hand, it's a lot easier for you guys to find retro tracks than modern ones, I would imagine. So maybe bringing in more retro tracks saves time? I love the 3rd and 4th gen music and have a preference for those tunes. Because there were hard limitations to those consoles, each one feels like it has a certain character to it, and I like hearing how composers worked within those limitations. Also, that ear feel is pure sugar crystals. Nevertheless, I like to suggest modern tracks sometimes and if someone has a personal testimonial for a modern game, they should share it! As a collective, if we want more retro tracks, we should suggest more retro tracks. If we want more modern, we should suggest more modern. It all washes out over time. -I gotta split, gonna go hang with Blinks, Pinks, Inks and Clyde. ...I hope she gave those testimonies back. Anyhow, I say Josh and Emily won their empty pot regarding Game Gear Pac-In-Time vs SNES Pac-In-Time. And, perhaps more interestingly, the Game Gear version also sounds better than the Game Boy version. The SNES has an entirely different approach to creating sound, but the Game Gear and Game Boy both use PSGs, and the latter one’s PSG is just more powerful -- but of course Haju picked the best version for us. And that highly pitch bendy segment of Beach is real interesting. Regarding white noise: I am very much a silence person, and that is despite growing up in inner city suburbs. Regarding the bisecting of the show: count me as another patron with a slight preference for retro tracks who still feels that three and three is too prescriptive. Listening to this show has really broadened my taste in several ways, and I like that the current process naturally produces variety among episodes -- some more modern, some less. And, like others have said above, I want the show to reflect the patrons. That said, I do support trying out the up-front dusting of sugar crystals. It is a nod to this podcast’s origins, it is a message to new listeners who may stumble upon a mostly modern episode that old-school beeps and boops are welcome, and it would make Josh happy. The bendy part of Beach is a riff on classic Pac Man music played in the intermission scenes. I had never seen those intermissions before; I didn't know arcade games from the beginning of the 80s had cut-scenes and plots! I do know the jingle (I hear it all the time in Smash for one thing) and it is all over the place in Pac-In-Time's soundtrack. I am starting to realise that there is a whole world of Pac-Man game music that incorporates classic jingles, and I think that is great. Just to add to this as well, I think my other problem with making it so there is always retro tracks is that it greatly limits the variety of games being played. Josh mentioned he didn't even think of N64 tracks as retro, so we're talking a period from 1985-1995 as the 'retro music era'. That's a decade. However, there's 22 years of games to be represented since then, on systems with much larger game libraries. The other thing is that where does retro end and modern begin? The music from Mario 64 sounds way more 'retro' than the guitar driven CD music from Lords of Thunder, but Mario 64 was released a full 3 years later. Music from the N64 sounds nothing alike it's contemporaries on PS1 and Saturn, but PS1 and Saturn music also sounds nothing like PS2 or PS3 music - the music still evolves even when it's 'modern' sounding. How do the modern indie chiptunes fit in? Are the modern, or classic? To me I think trying to force even representation (or even any representation) kinda misses the point that it's all VGM and it's all good. It also puts the classic stuff on a pedestal that I think it's already priveleged too - everyone knows the soundtrack to a lot of classic 8 bit titles, and it's played on all sorts of podcasts, youtube videos etc, but the modern stuff tends to be overlooked. I like that we get to hear stuff I'd have never known otherwise. JT, that was a perfect performance of pinball poetry--an astounding audio acceleration, assembled of alliterations. Happy harmonics! Thanks dood! You still need to release an mp3 of your SFII karaoke by the way.